Lily of the Valley is my favorite flower. I love the shape and smell. I am also reminded of my Grandmother’s garden in the house she had when I was a kid. That house and garden holds magical memories for me. I have a memory of fresh cut Lily of the Valley in a small juice glass on a counter in the kitchen. The memories are probably more special because that house and garden no longer exist. When I was about 11 my Grandparents sold that house. A contractor bought it, destroyed the house and garden and built apartments. 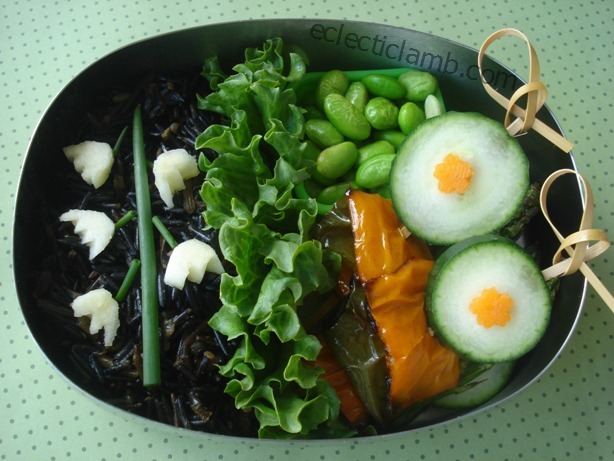 This entry was posted in Bento / Cute Food and tagged bento, lily of the valley shaped food, vegan, vegetarian. Bookmark the permalink. Oh I am so happy! Thank you! oh, its a lovely bento! A greenery sight! The design elements are very evident in this Bento – good color contrast too plus I bet it all was delicious. I also love Lilly of the Valley flowers. Grandmother memories are so wonderful at times. Thank you so much Mary Lee! This is such a beautifully-formed work of art. That it is edible is the plus! The house where I grew up is gone, now, along with my mother’s gardens. In my memory, the flowers are all blooming (an impossibility, as daffs and salvia and azaleas are not the same -season bloomers), and it is perpetually beautiful. Thank you for stirring those memories. Thank you so much! I loved reading about your beautiful memory. Beautiful bento! I love the bamboo. It adds such an organic feel to the whole thing. I love your tribute to your gradmother, too. I would feel out of this world if I open my lunch box and finds this. It is a pleasant Spring treat for the eyes! The memories linked with the flowers make this a special lunch box. Keep going! My Grandma had it in her garden too. I love it! I also associate lily of the valley with childhood memories. Lovely bento! Thank you so much! It is so interesting how many of us have childhood memories of lily of the valley. This is so pretty! Glad you have lovely memories of lilies of the valley, it is one of my favourite flowers too! Thank you so much! It was delicious. I love this- so pretty! I love the Lilly! I like the the funny but modern look of it. Great! Great bento and great memories.